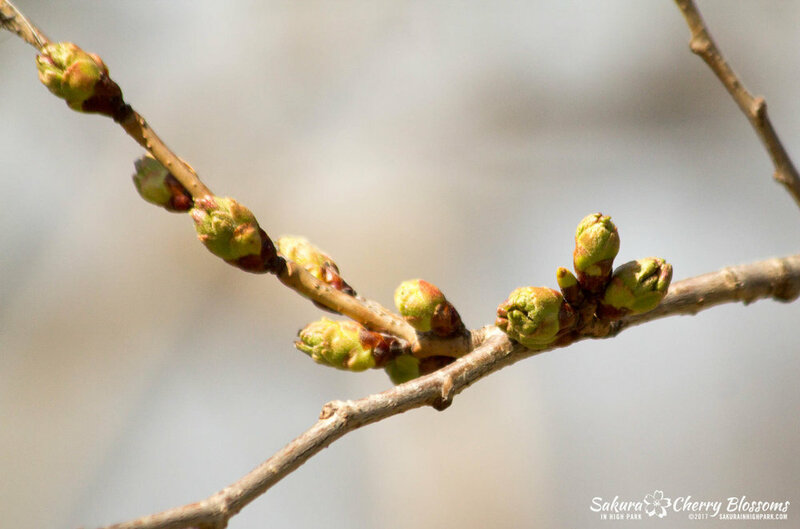 Sakura Watch, April 14, 2017 - cherry blossom bloom dates get closer as significant sakura bud development have ramped up to stage 3 and even stage 4 throughout the park. Look at the photos taken Thursday afternoon, and we can verify the bloom dates will start even sooner than earlier estimated! 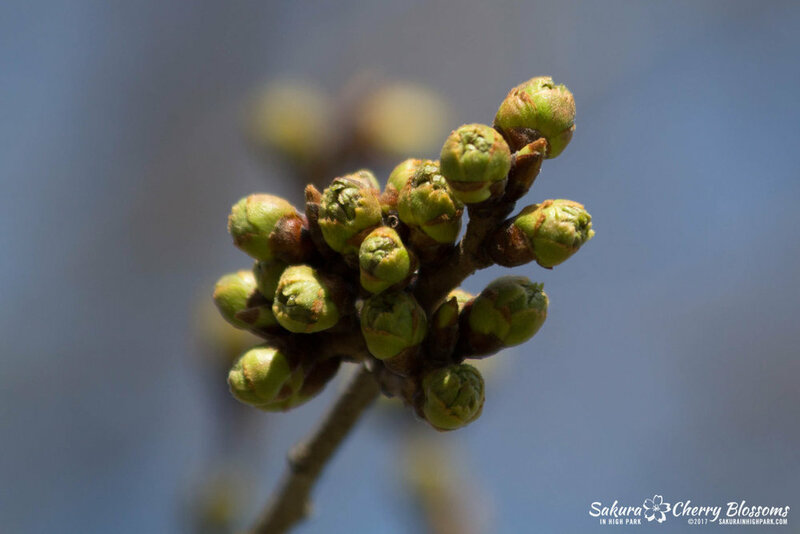 The vast majority of sakura cherry blossom buds seen as well into stage 3 of development. You can see round, swollen buds with florets beginning to emerge out from the tips. Also, notice the dark pink colours on the sides and tips of the buds which are also good signs or progress. According to past year observations, once at this stage, the blooms will be approximately 16-21 days away from full bloom. This timeline brings us right into the end of April 28 to early May 6 week for a potential full bloom! Most surprising was to see that nearly 10-15% of the buds were already moving into stage 4 of development! Incredibly the sakura cherry blossom buds in this stage had florets partially extended and a few fully extended. Each floret was clearly visible with the telltale sign of deep pink/purple colour which will eventually open up to blossom! Most exciting is that buds in this stage usually begin to open up within 6-10 days. 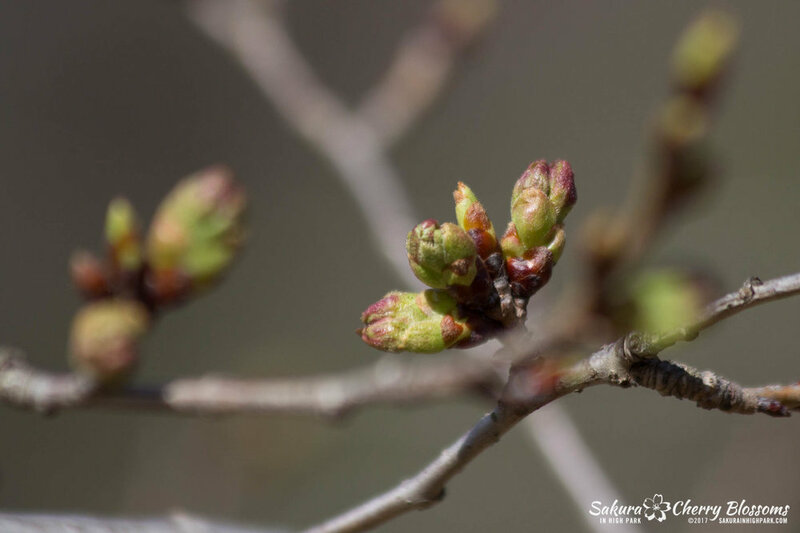 This means there is a possible chance that at least a tiny percentage of blossoms may start opening up by next weekend between April 21-23! So with this fantastic Easter weekend surprise, I will be sharing more frequent updates over the next couple weeks. As always is the big factor, the weather still plays a big part in either moving the dates either earlier or later. Keep following this website and our social media pages to know when the best time will be to see and visit. Hope everyone has a safe and Happy Easter long weekend!